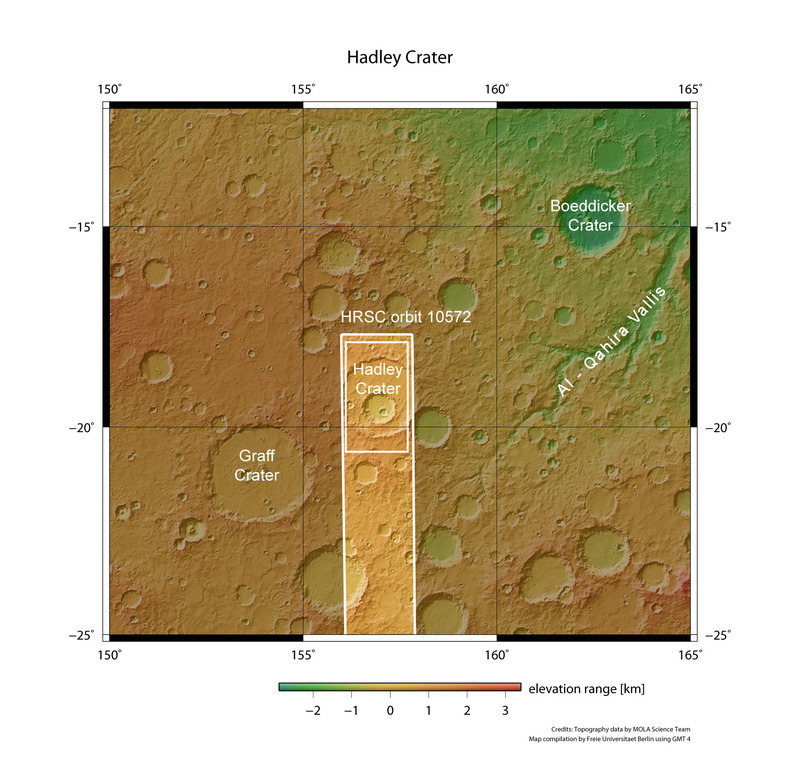 Hadley Crater on Mars has been subject to several impacts by large asteroids in the course of its history. The 'craters within a crater' formed in this way give us a view over two kilometres into the Martian crust. 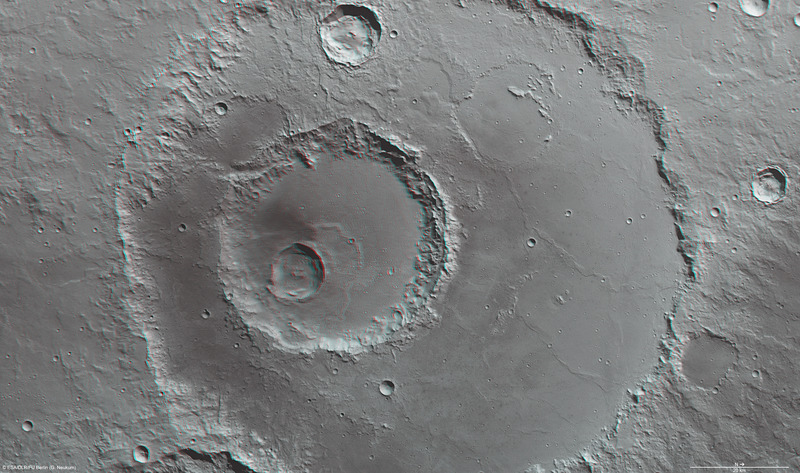 Hadley Crater on Mars has been subject to several impacts by large asteroids in the course of its history. 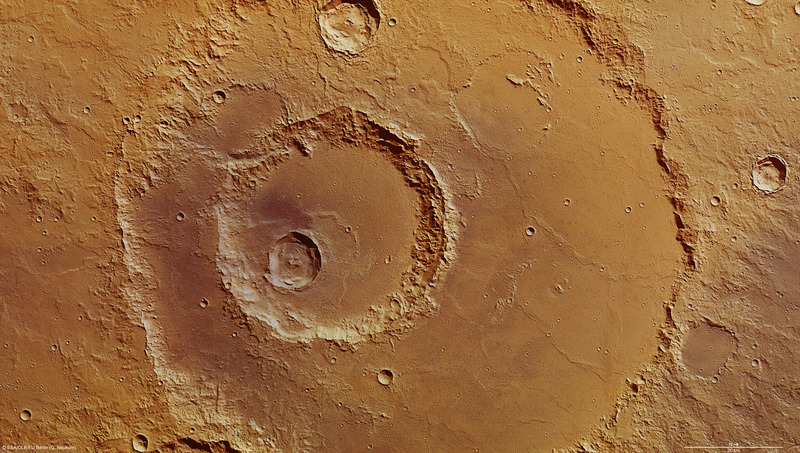 The 'craters within a crater' formed in this way give us a view over two kilometres into the Martian crust. This was revealed in images acquired with the High Resolution Stereo Camera (HRSC) on 9 April 2012. The HRSC camera on board ESA's Mars Express spacecraft is operated by the German Aerospace Center (Deutsches Zentrum für Luft- und Raumfahrt; DLR). Of particular interest are the ejecta blankets of the small craters inside Hadley. Two of these, the western (at the upper edge of the colour image) and central depressions, are surrounded by ejecta blankets with irregular, lobate edges. This is an unmistakeable indication of the presence of ice or water beneath the surface at the time of the impact. These volatile materials were mobilised as a result of the enormous amount of energy produced during the impact event, and this led to some degree of liquefaction of the Martian surface materials. The partially liquefied ejecta material was then deposited around the impact crater, creating a distinct surrounding terrace - which is easy to see in the perspective oblique view. The topography of the two craters suggests there may have been subsurface ice at depths of up to around 1800 metres. 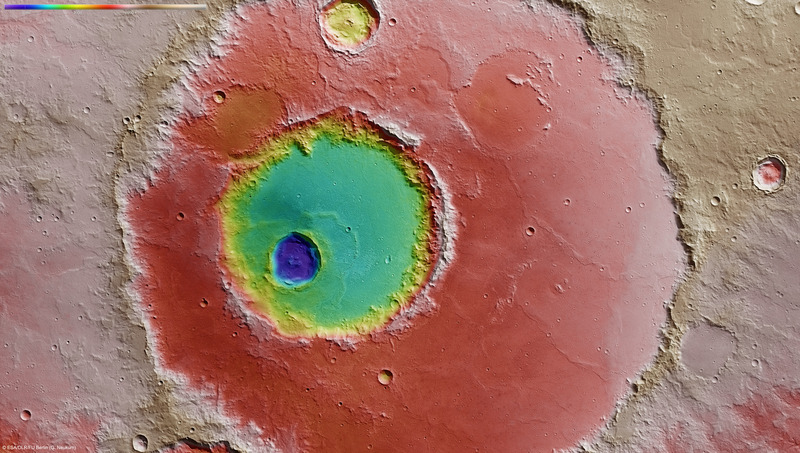 How was Hadley Crater formed? The formation of this multiple crater can be envisaged as follows. 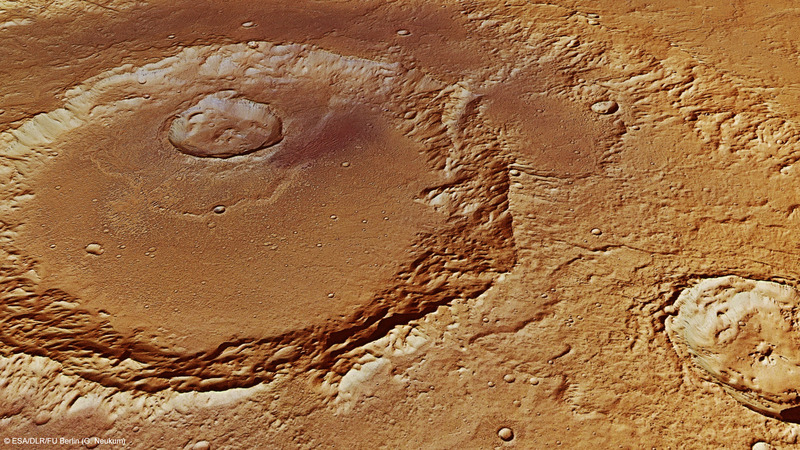 An asteroid impacted the surface of Mars, creating the large, 120-kilometre-diameter crater. Later, the crater depression was largely filled with either lava or sediments. The presence of what are known as 'wrinkle ridges', whose shape in reminiscent of twisted ropes and which extend longitudinally through the northern (right) section of Hadley Crater suggest that lava was involved. Wrinkle ridges have a volcanic origin; they are caused by the solidification of an initially low-viscosity lava blanket. The crust is compressed during the cooling process, creating the characteristic ridges; numerous wrinkle ridges can be seen on the Moon. More asteroid impacts followed. Several 'burials' also indicate this - craters within Hadley Crater that have been almost completely 'erased' but whose circular rims still break through the crater floor. Today, Hadley Crater offers a view almost 2600 metres into the Martian crust, enabled by three large craters lying inside one another. Closer inspection reveals a number of additional, small, younger craters in the lowest region (blue area in the topographic map). Hadley Crater lies to the west of the Al-Qahira Vallis (Arabic for 'Mars'), in the transition zone between the ancient, southern highlands and the younger lowlands. It was named after British lawyer and meteorologist George Hadley (1685-1768), who also gave his name to the Hadley cell and is not to be confused with English astronomer John Hadley (1682-1744), after whom the famous Hadley Rille on the Moon - a lava channel that was the site of the Apollo 15 landing in 1971 - is named. 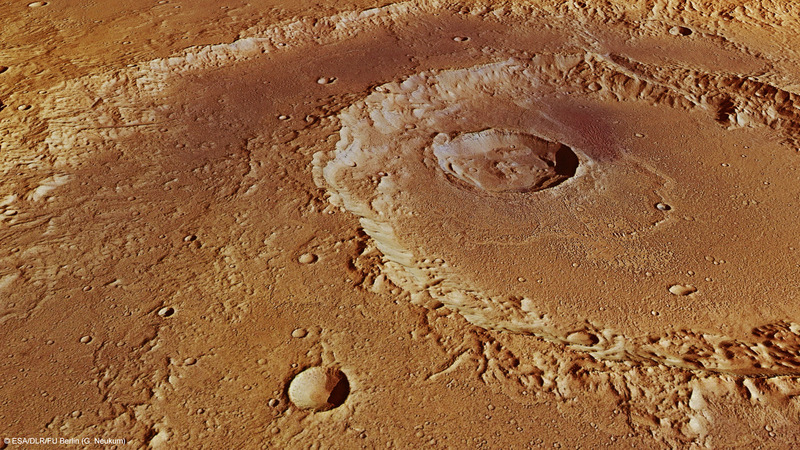 The images acquired with the HRSC were captured during Mars Express' orbit 10,572, from an altitude of around 500 kilometres. The image resolution is about 19 metres per pixel. The images show a section at 19 degrees south and 157 degrees east. 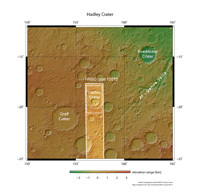 The colour image was acquired using the nadir channel, which is directed vertically down onto the surface of Mars, and the colour channels of the HRSC; the perspective oblique views were computed from the HRSC stereo channels. The anaglyph image, which creates a three-dimensional impression of the landscape when viewed with red/blue or red/green glasses, was derived from the nadir channel and one stereo channel. The colour coded plan view is based on a digital terrain model of the region, from which the topography of the landscape can be derived.